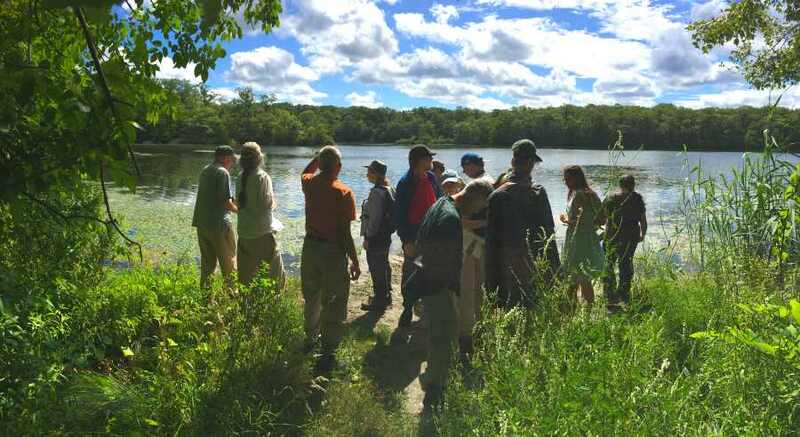 Here is what we saw at this bird walk led by Putnam Highlands Audubon Board Members Ryan Bass, Kyle Bardwell and Perry Pitt around the Duck Pond at the TOEC. There were 15 participants and excellent weather. Greg Kofsky of the TOEC provided a nice introduction on the property and the programs that the facility runs. Kyle shared that it was his first time hiking at the TOEC and said it is a really neat place He shared these photos. We had two Master Gardeners on the walk, including Leah Kennell, the curator for the Wildflower Island at Teatown, who provided excellent insights and answered questions from the participants. The cedar waxwings were hunting bugs over the pond and perched right over us on a dead limb. The red winged blackbird was showing more white than red on the wing, kind of interesting.